The Corn Walk of Horror is a pre-determined trail through corn and hay. There are hauntings along these paths that may catch you off guard and have you wondering where you can turn to get away from the blood curdling screams and intimidating darkness. Just when you think you are nearing the end, another frightening villain finds you. This attraction is not recommended for young children. 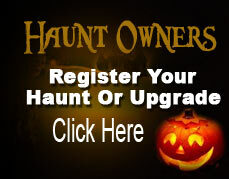 Haunted Hay Maze: Try your skill in our Haunted Hay Maze. The evening intensifies this attraction. Who (or what?) is following you? Will you be trapped in the Hay Maze so you can't find your way out? Oh no! Did you get stuck in another "Dead" end? Night Chills Haunted Hayride: The thrill of Night Chills on a dark autumn evening! We strive to give you an extraordinary haunted hayride. Starting off serene and winding your way into the "Gates of Hell". Our woods have been transformed to include many of the spectacular creatures that are in your nightmares! You are trapped in the wagon! You cannot escape! Will your driver bring you back safely? Or will you end up being forever stuck in the chills of the night? 7:30 p.m. to 10:00 p.m. on October nights listed above. Combo tickets are $30. Individual tickets available (see specific page). The last haunted combo ticket is sold at 9:30 p.m.